Molds on this page are currently in our workshop and are being readied for replication. Ask to be added to our mailing list to be notified when newly replicated molds become available. Do you know anything about this image? Replicas of this mold may be available August 6th 2014. 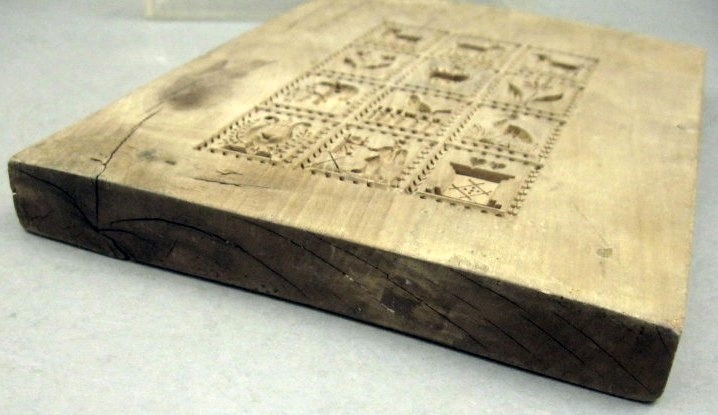 This mold measures about 9 7/8″ x 5 1/2″ and carries the number 21 as well as the initials J ? B. It is a motif we have not seen. It almost looks like a Saint wearing a Quakers hat?? 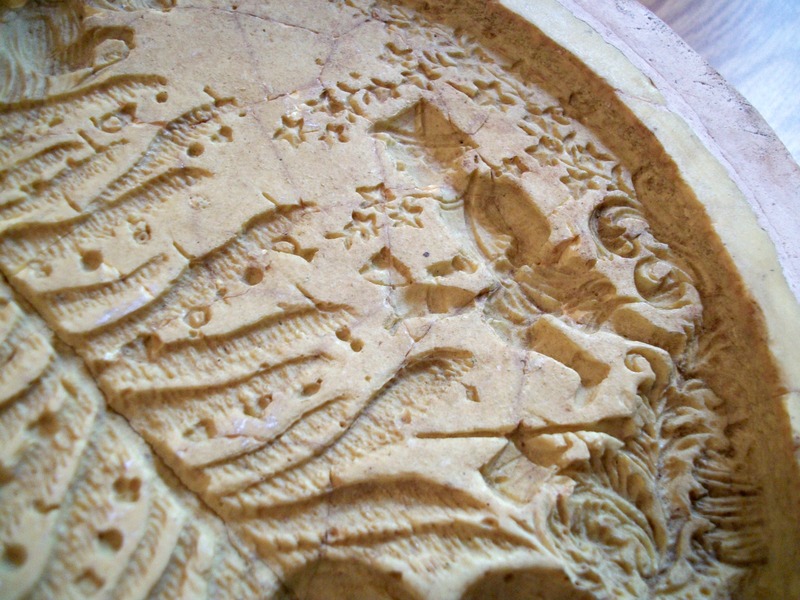 The mold is from the Alsace region of France. 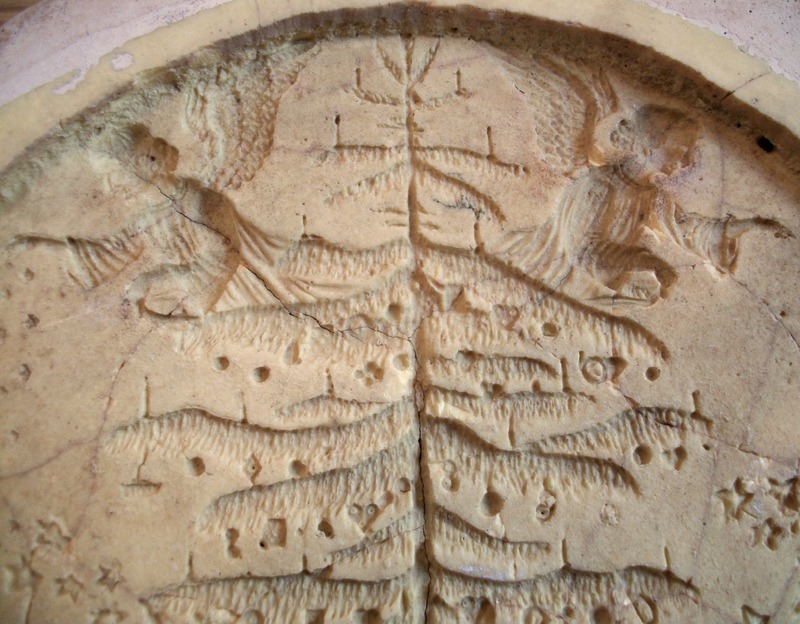 Do you know who this biblical image might be? Thanks to all those that wrote in about this image. *“This the precious “Infant of Atocha” – a much revered devotion to the Child Jesus. You can read more here as well as see a picture. * It is the good shepherd.Jesus as the good shepherd.You can see the sheep at his feet. *Hello, I’ve looked carefully and I think the mold you asked about is Le Bon Pastuer, just presented in period costume. 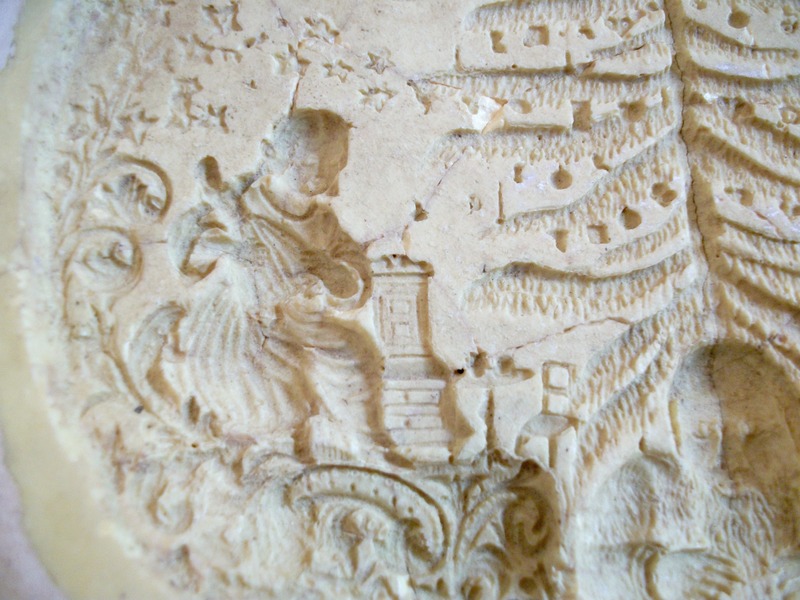 The figure is holding the globe which is usually only associated with images of Christ. For a while I thought it might be St Roch (pronounced ROCK) as it carries the pilgrim pouch over the shoulder but it does not have the dog ( and dog usually licking his wounds as the St became a leper after caring for lepers and traditionally dogs licked his wounds clean) Of course if they were dogs in you mold not sheep then it might well be St Roch but they look like sheep to me which makes it Bon Pastuer. *I was looking on your “In the workshop” page to see what molds may be available. 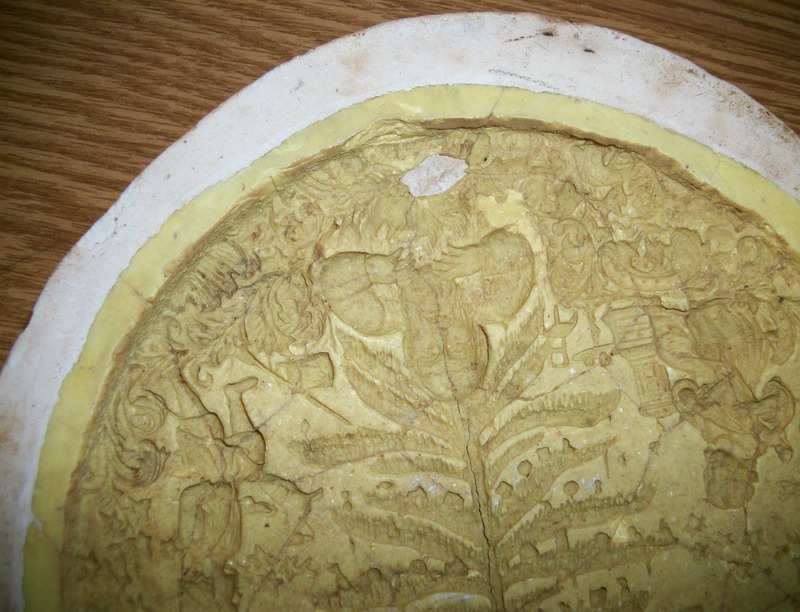 I came across the mold described as a possible “Saint wearing a Quakers hat.” I have to admit the hat really threw me but I think we can safely say that the image is that of Christ. More than likely a version of The Good Shepherd. 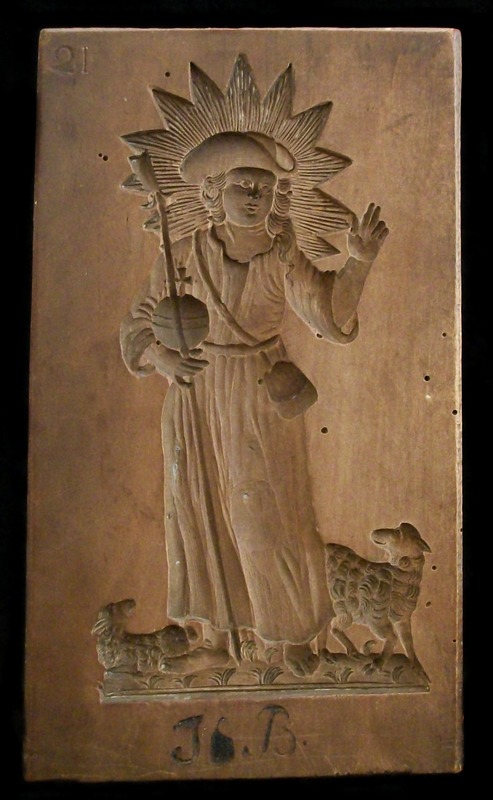 Christ of The Good Shepherd is traditionally depicted as a beardless youth holding a staff to protect and guide His sheep. Your mold has other symbols of Christ. His right hand is raised in a gesture of benediction. The 3 fingers up represent the Holy Trinity and the 2 fingers down represent the 2 natures of Christ. He also holds the globus cruciger (cross-bearing orb) showing Christ’s dominion over the world. His head is surrounded by a halo of radiant light (rather than the typical round disc or circle halo) which depicts a holy person. “Rule the World” motif. In the foreground a human figure in the typical dress from the 18th century. In the background various anthropomorphized animal figures such as donkeys , fox, rabbit , dog , bull, deer, etc., dressed in doublet and partly armed, note the standing donkey figure with shield and the arm inside his jacket (similar to Napoleon ) Overall, an extremely rare subject. Not sure of the whole meaning yet. Tho my first thought was that it applied to today’s environment. And of course, the carver thought it also applied in his time. The replica for this mold will be #1721 and should be available within a week. 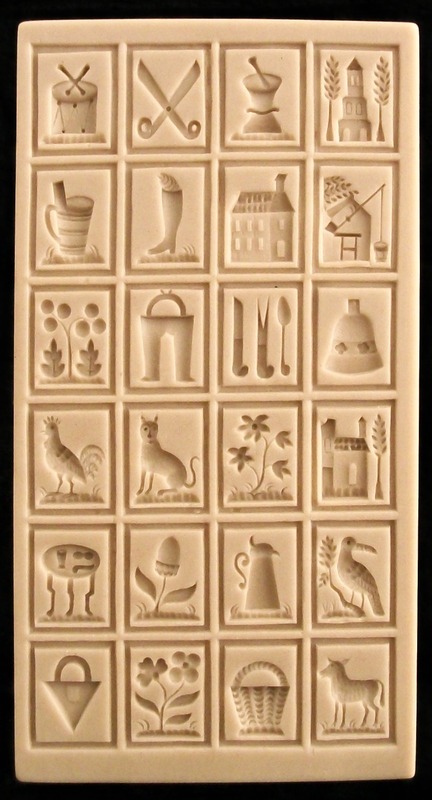 Hanover Flowers Marzipan Mold Original. This mold measures about 6 ¼” x 6” and is from about 1900. It was owned by a baker who worked at a pastry shop in Hanover Germany. Very deep with good details. A very nice classic form. Eifel Fairy with Rose mold original. This mold with a motif of a fairy holding a rose bloom comes from Eifel Germany. 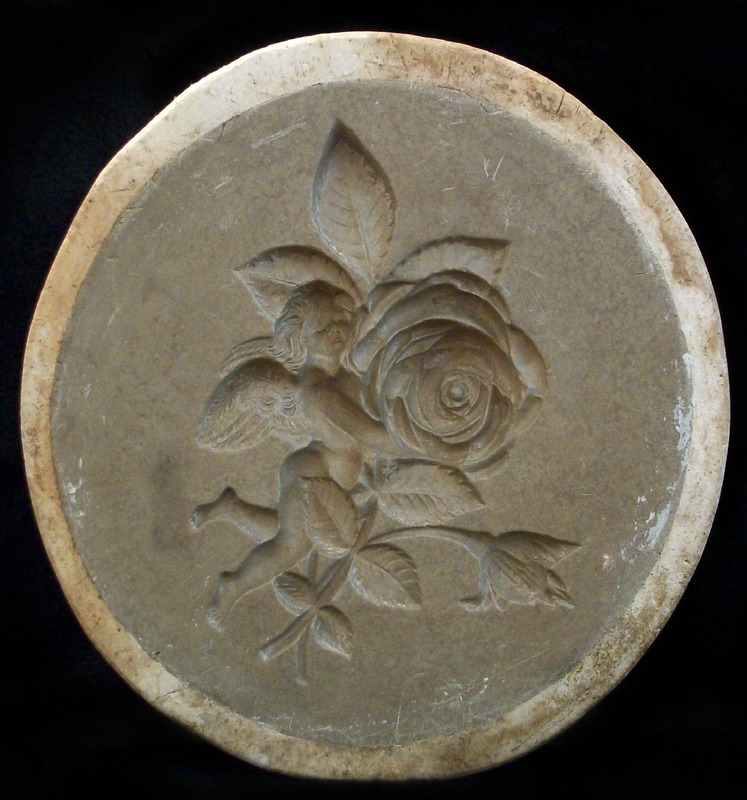 This is a large mold measuring about 11” in diameter and would have been used for Marzipan to produce a cake topper. We will be starting the replication process in February 2014. Palenberg Garden Fairie Marzipan mold original. A great Art Nouveau style mold. This mold with a motif of a fairy holding a bowl of fruits comes from Palenberg Germany. It is dated to about 1900 which puts it square in the Art Nouveau period. 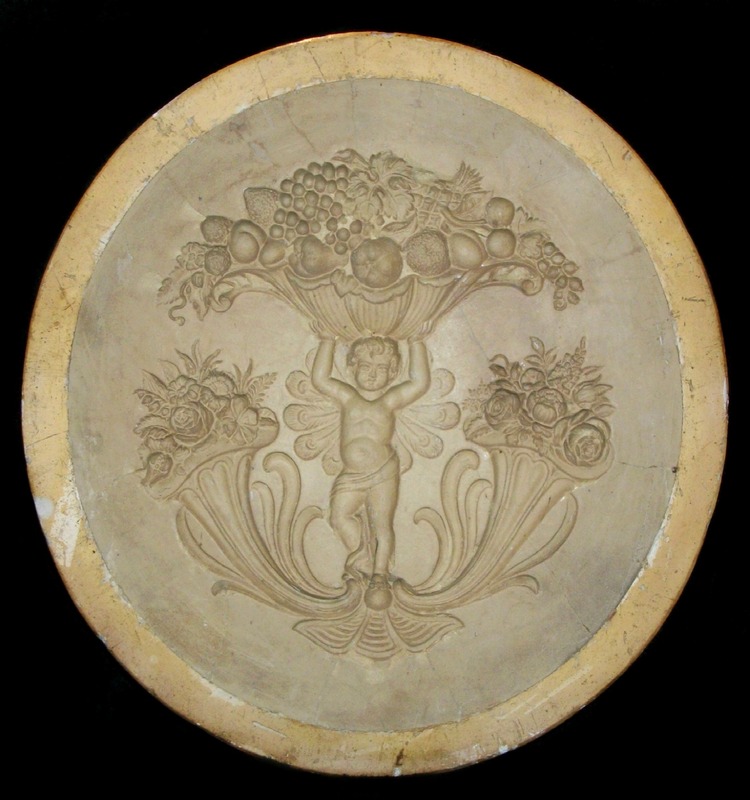 This is a large mold measuring about 12 ¼” in diameter and would have been used for Marzipan to produce a cake topper. We will be starting the replication process in February 2014. 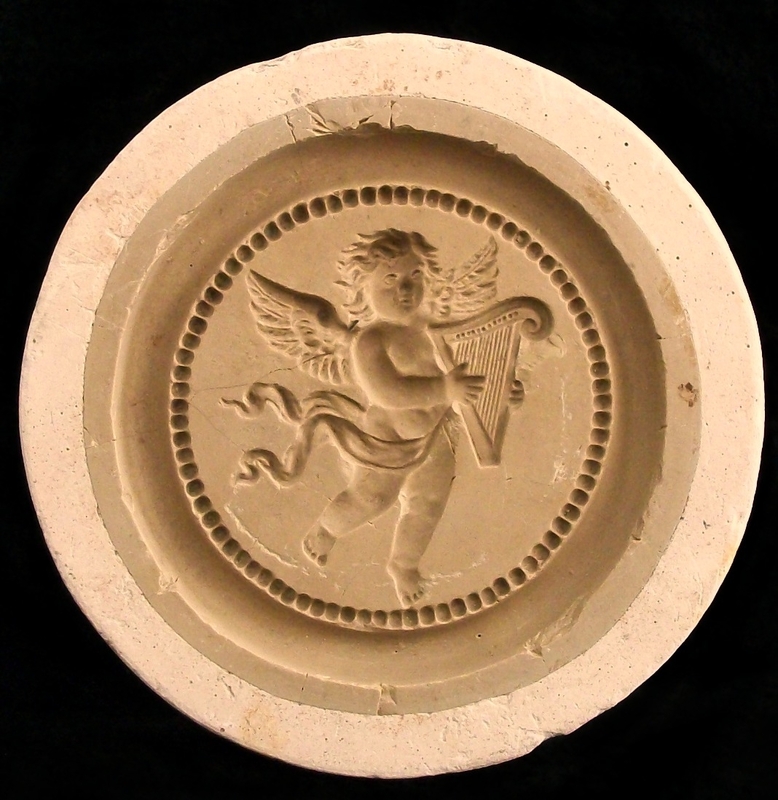 After so many months we are slowly progressing with the replication of the Palenberg Garden Fairie Marzipan mold. 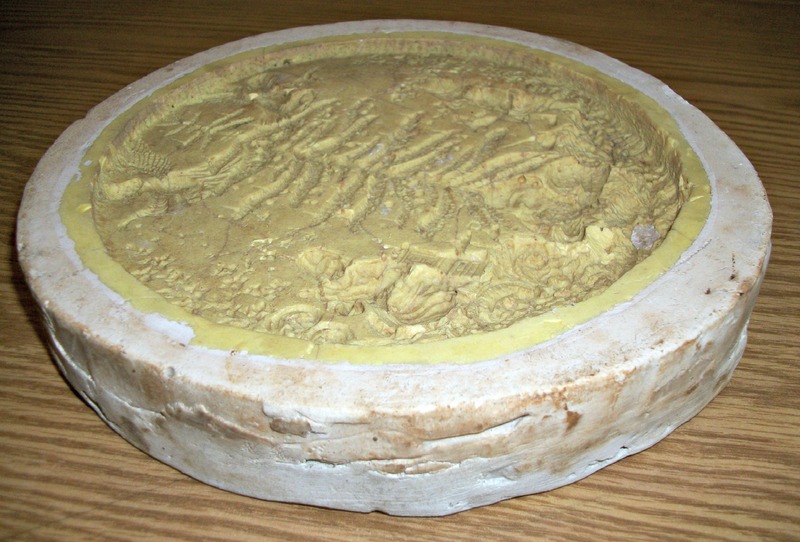 This mold measures about 12 ¼” in diameter. The area with the design measuring about 10 ¾” in diameter. It is from about 1900 which puts it square in the Art Nouveau period. All of the images are very detailed with good depth. This original is from Palenberg Germany and shows wear from use. Alice has taken the first steps to repair what needs repair but after I produce a hard copy she will again need to attend to other repairs. We will also be bringing it down in size. A working restored replica is still months away. It is a pleasure to be working with this mold. 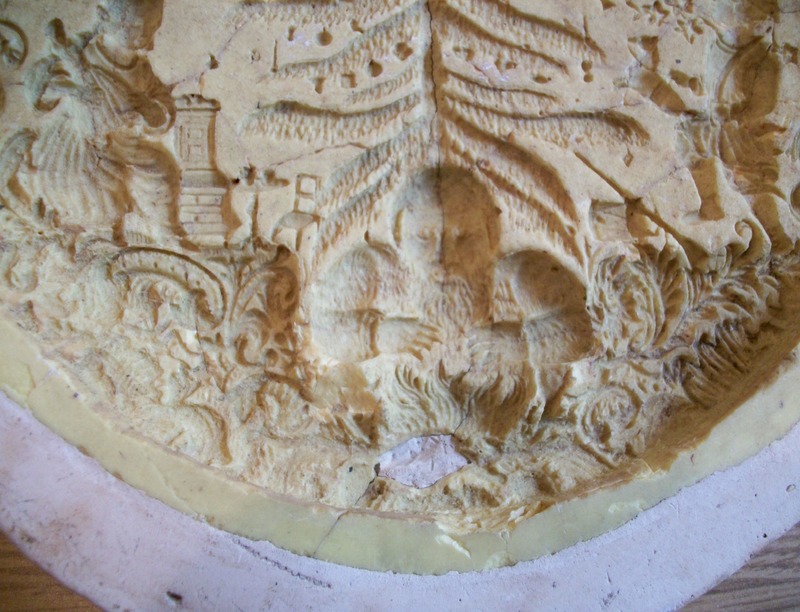 This mold was originally used to produce a cake topper. Marzipan was likely the medium. Beautiful. I am looking forward to producing my first topper from it. Some molds will take longer to replicate due to their different challenges. We are very excited to have the opportunity to work on this mold. 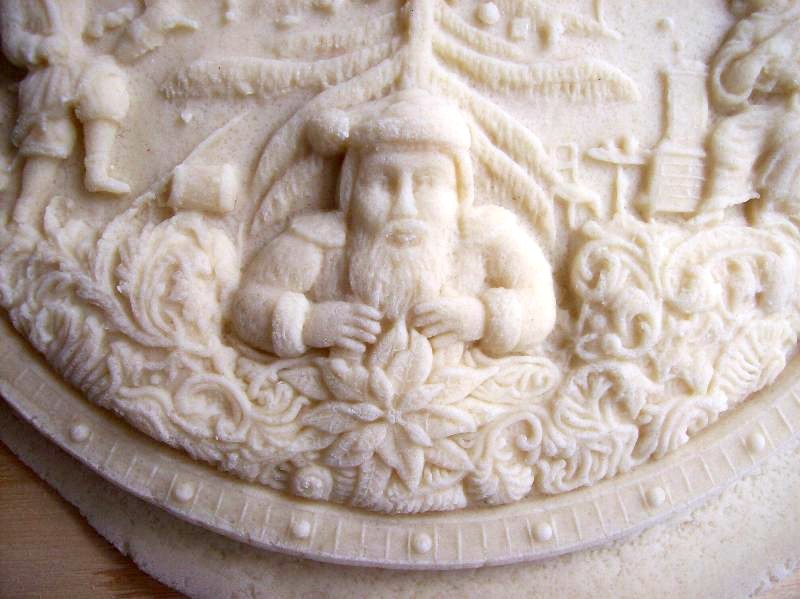 The original Lemgo Victorian Christmas Marzipan Mold. 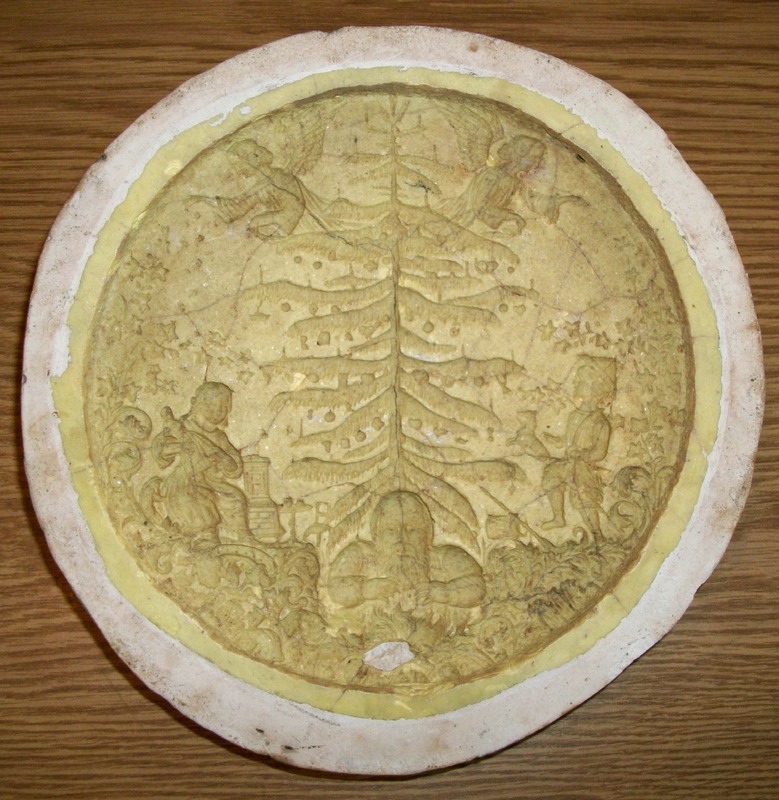 This mold measures in total about 9” in diameter with the area of the design measuring about 7 ½” in diameter. All of the images are nicely detailed and have good depth. This original is from Lemgo Germany and had at one time belonged to a baker that worked in a pastry shop in Hanover Germany. It is from the time period between 1882 and 1903. It is not in terrible condition but it is in a very rough condition. There are numerous hairline cracks, chips, holes and an old patch job just below Santa. This one will be a labor of love and we are looking forward to restoring it to its original beauty. This will make a beautiful cake topper. We hope to have it finished by November 2014. The mold has been given a wider border and all of the hairline cracks have been repaired. The mold will now go to Germany to have additional fixes and a decorative border added. and have fine details refreshed. 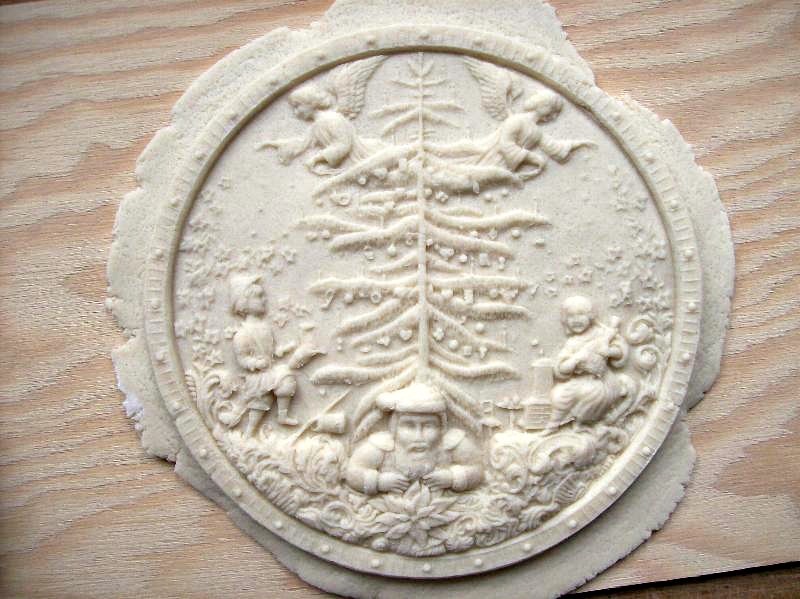 Lemgo Christmas Marzipan Mold Replica Start. The carver has finished the repairs and additions that were requested. 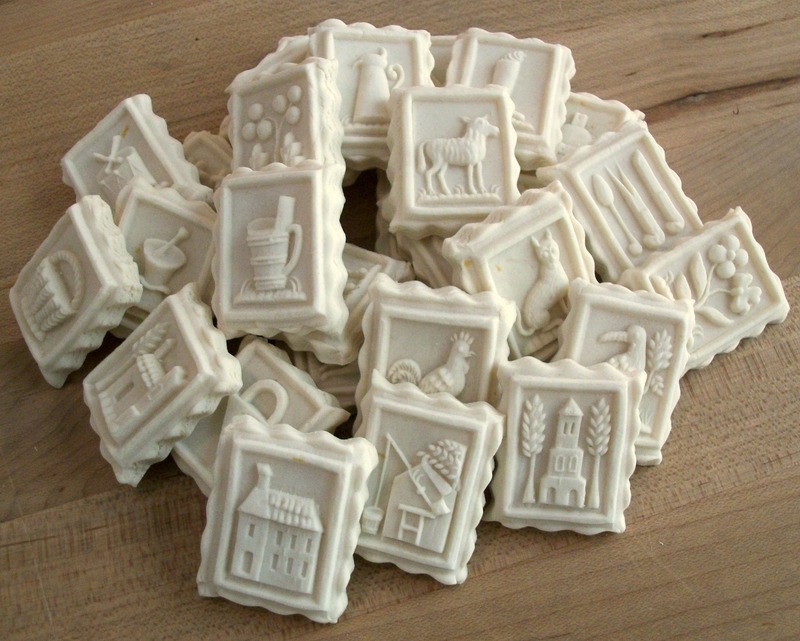 The restored Lemgo Victorian Christmas marzipan mold with our additions. 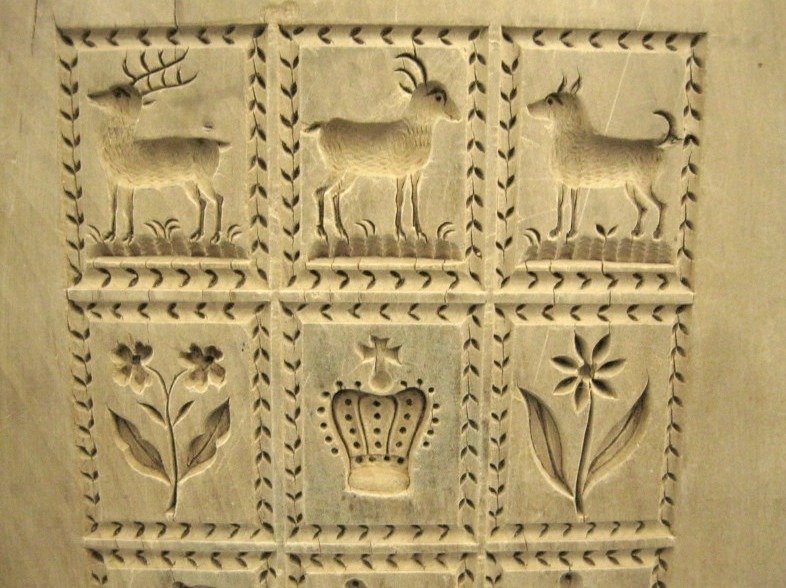 The border design is from the time period that the original mold was carved. The very first impression from this mold to show the changes in the design. Close up of Santa’s changes. He has the addition of a fur collar, fur trim and a new hat. 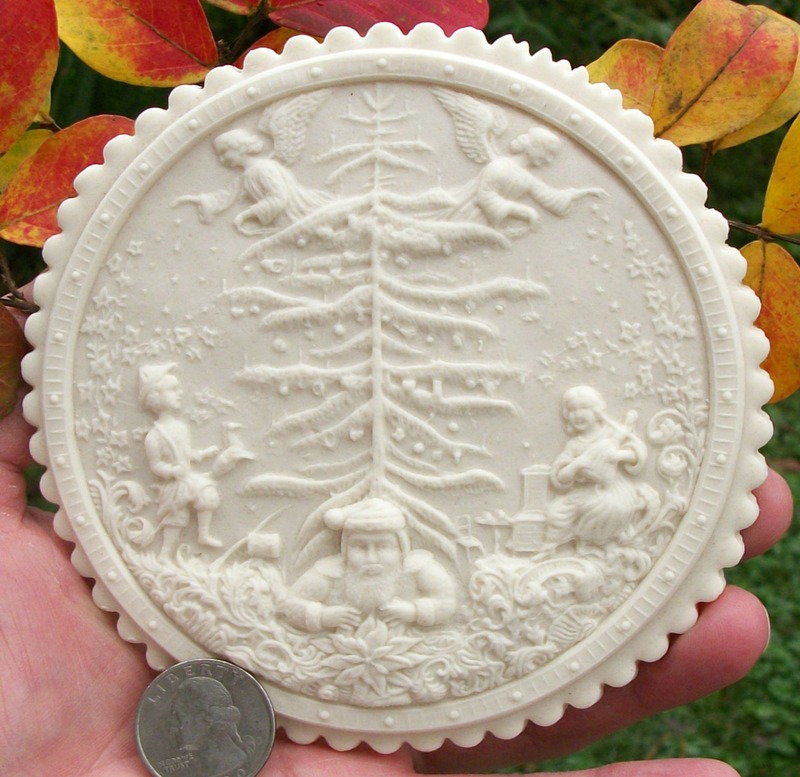 The Lemgo Victorian Christmas mold has arrived from Germany and it will now be sent to Alice and Jerry for finishing and polishing. After that it will be returned to me for the beginning of the replication process. Its going to produce a beautiful cake topper at 8″ in diameter. The images are crisp, detailed and dimensional. 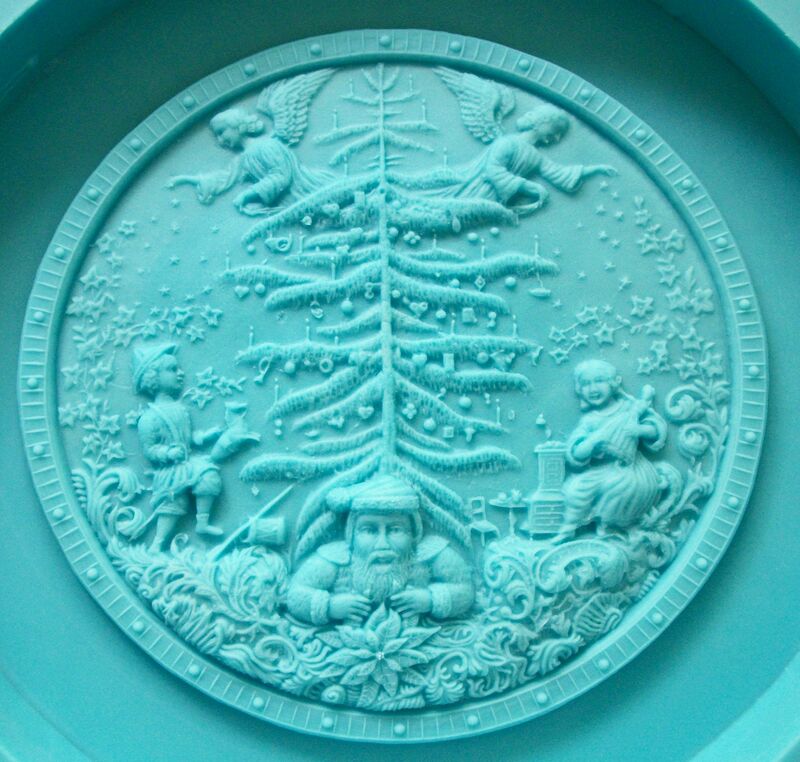 First Impression of restored Lemgo Victorian Christmas mold. This is the first Impression I made of the restored Lemgo Victorian Christmas mold. It measures about 10″ in diameter with the image being about 8″ in diameter. We plan to be able to offer it in more than just the one size. It should be ready by October sometime. This would make a beautiful cake topper. A “Memory Maker” for sure. We have completed replication and are making the Lemgo mold available in four different sizes. 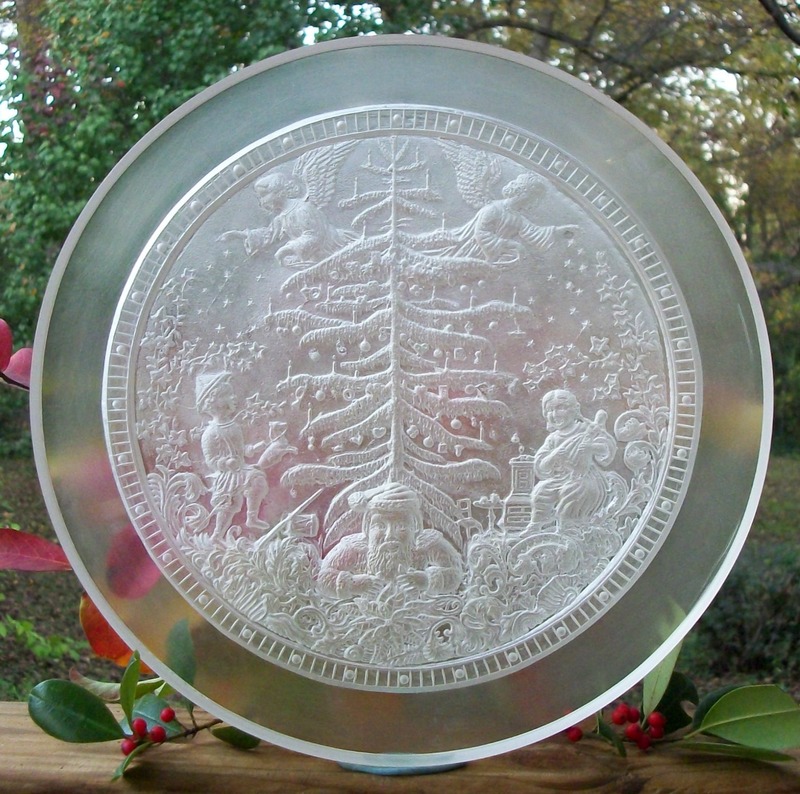 #1937-10 Lemgo Christmas Marzipan Mold in Clear. – $188.09. 8 1/2″ in diameter. Cookie made with mold #1937-8. About 7″ in diameter. March 2013 – Animal Board front. Currently being worked on by Alice. March 2013 – Animal Board back. Currently being worked on by Alice. decided we weren’t happy with it and so began the process again. Very sorry for the delay. 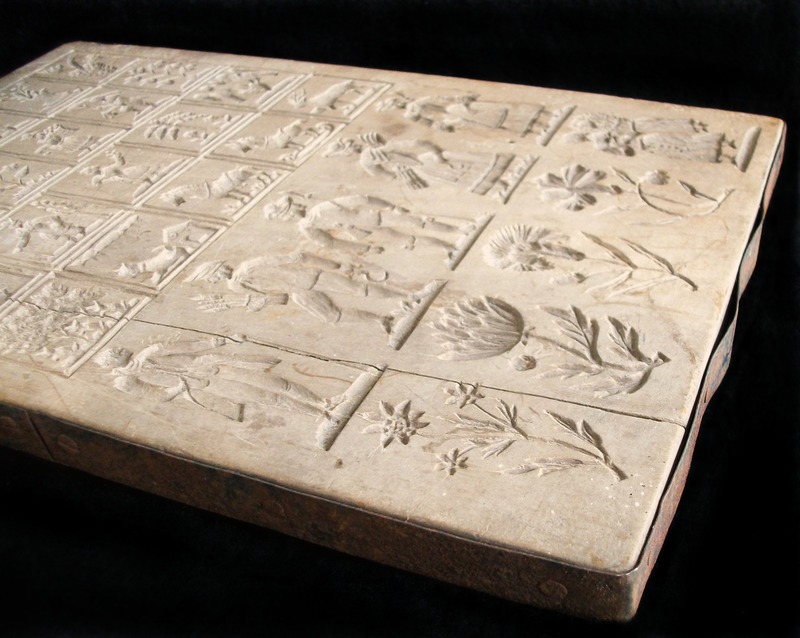 This original Marzipan mold is from the time period around 1880. This mold had belonged to Frau Menzens grandmother. 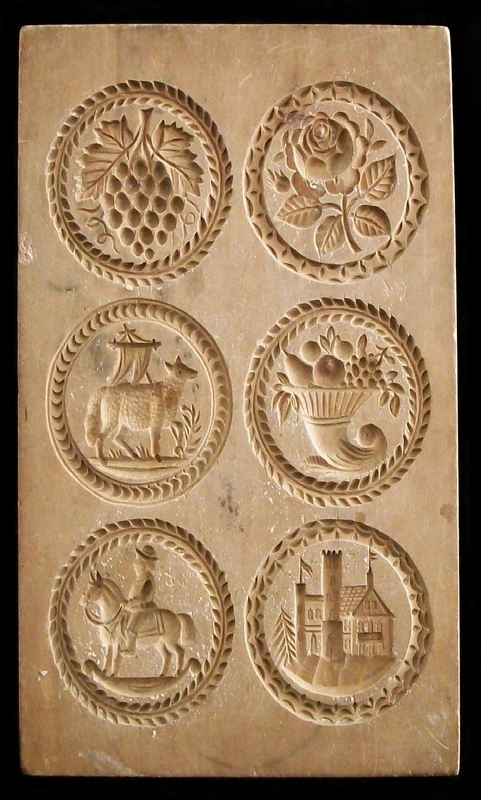 A very fine mold that was designed for producing Marzipan that were most likely used as cake toppers. 1-24-13: Alice has put many hours into restoring the mold and it is now in its last leg of production. The image produced is very detailed and beautiful. 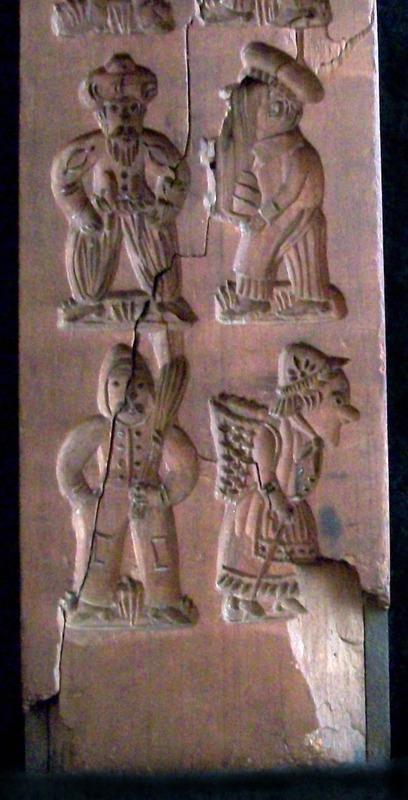 Original wooden mold that was used at A. Kempf bakery in Nuremburg Germany. Six image A. Kempf board: This mold is being made into six separate individual molds that will measure about 3″ in diameter each. They will be easier to use in production and also will allow you to pick only one or two images that you like without having to get a big board of six. Alice will be deconstructing the images and I will be making the individual molds. The images are all beautiful and detailed. Perfect cup cake topper size. Aalen 24 Image Mold end view. Aalen 24 Image Mold side view. 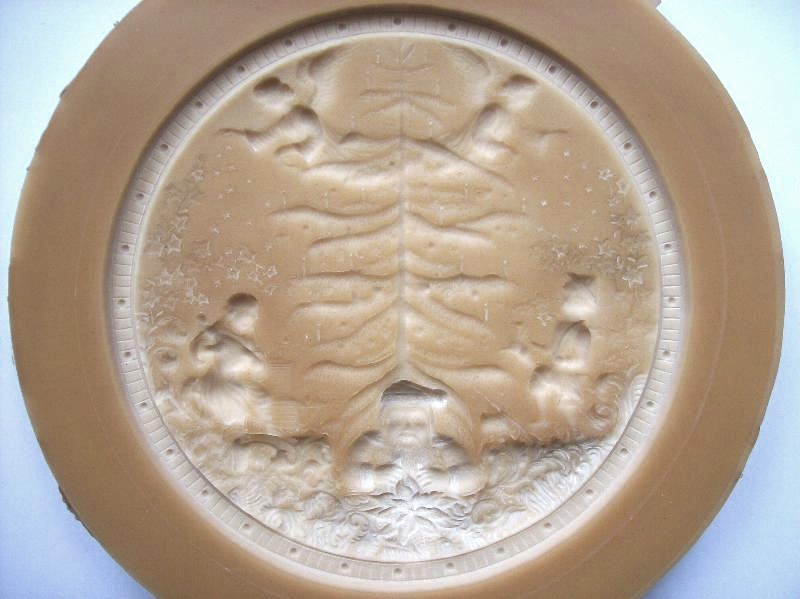 Aalen 24 image mold: This mold measures 8 1/8″ x 4 1/4″ and was sent to us by Frau Iris in Aalen Germany. 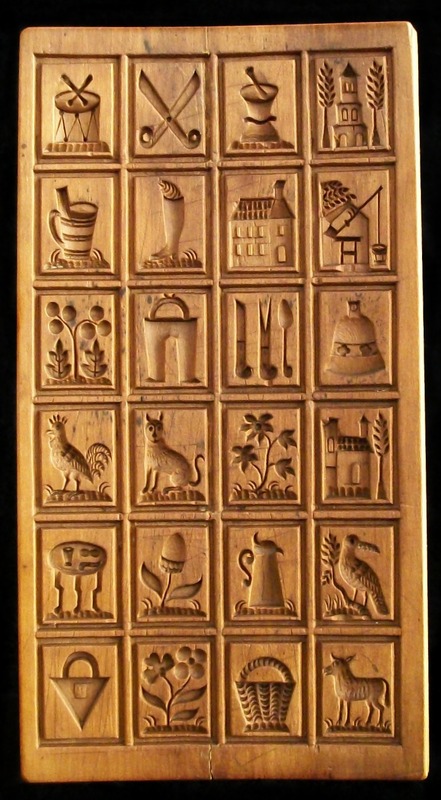 It is a mold that she had acquired from the dissolution of an old bakery in Nuernburg. As you can see by the photos, the mold has a very bad curve that makes it chancy to use. It may split if pressure is applied at the wrong place or just applied at all. We are tasked with producing a good flat copy that can be used. Can we do this? Certainly! We developed and pioneered the method and techniques to do just that. After working copies are produced, they will be for sale by The Springerle Baker. 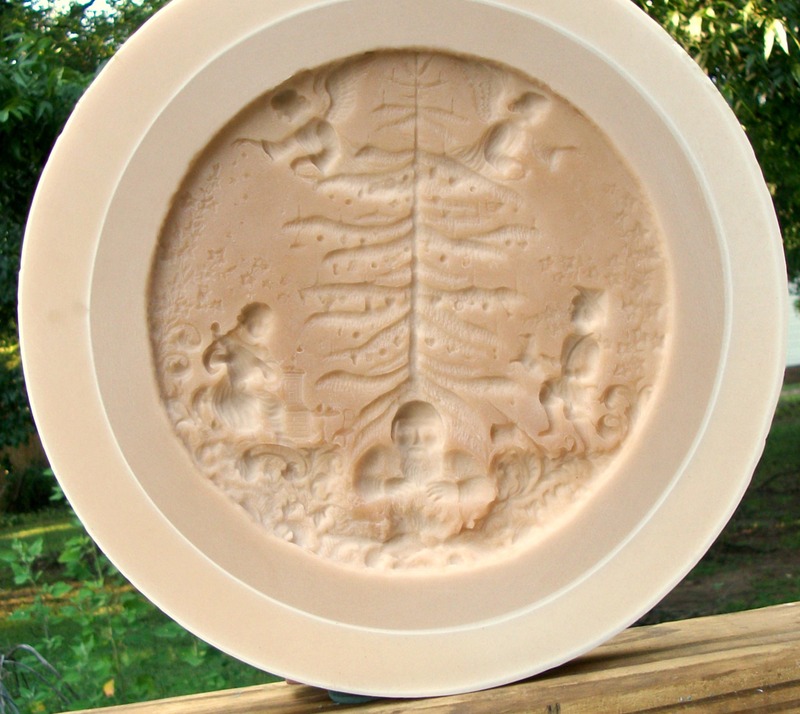 Below is the finished replica of the Aalen 24 image mold. Corsi Musketeer: This mold is from Ennenda in Glarus Switzerland but now resides in the Mildred E. Jenson Collection here in the U.S. 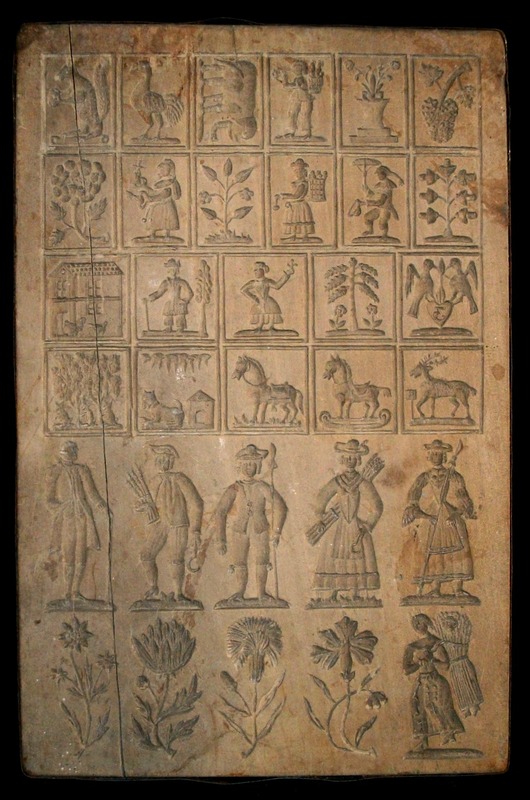 The mold measures about 7 ¼” x 2 ¾” and is estimated to have been carved around 1680. It is well preserved with only a couple worm holes and other worm damage. Nothing serious. This very fine and detailed mold looks to have been made by a master carver and is one of the very finest I have ever had the privilege to work with. It will produce a very fine first rate cookie or confection. It looks to be necessary to create more of a border around the image as it goes right up to the sides in a few spots. Copies are available now. 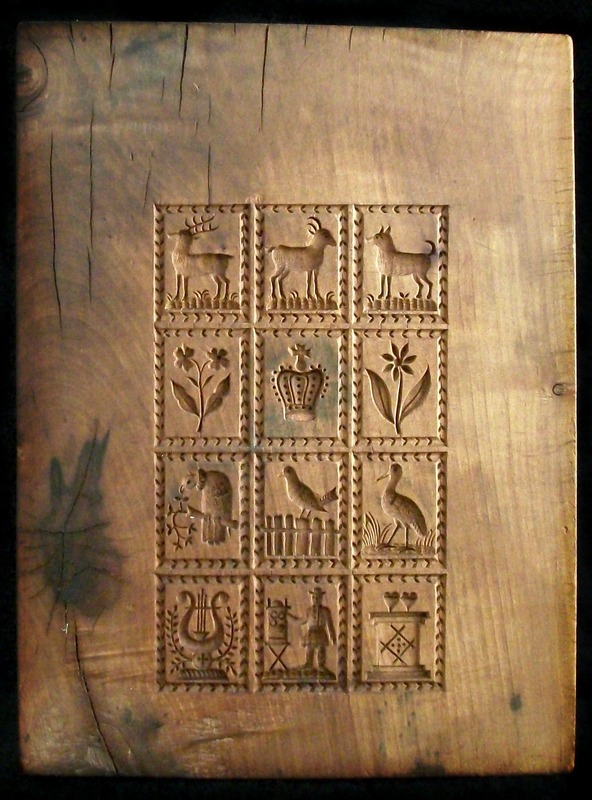 This mold measures about 11 3/4” x 7 1/2” and comes to us from the town on Cham in the Bavarian Forest area of Germany. I’m told it had at one time been in use in an old pastry shop there. As you can see, the original board suffers from years of neglect. It looks to have been stored away and then forgotten. Many times I have received pictures of old molds that look to be in rough condition. 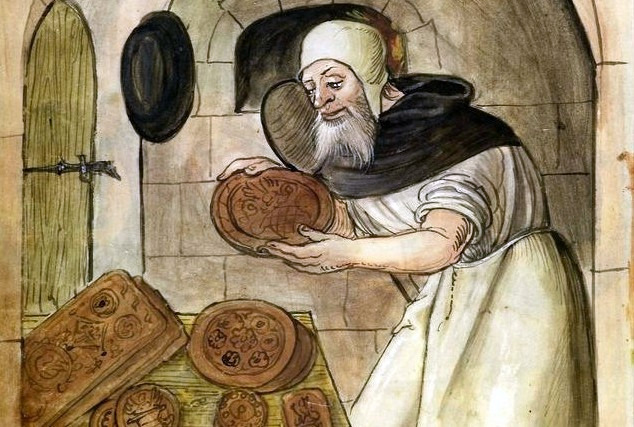 Most times a story is relayed to me that the bakers had closed shop and stored their molds in their cellars, attics or barns. Some molds I would imagine may have been damaged and then put away and forgotten as seems to be the case with this, the Cham mold. This mold looks to have cracked and then a metal band was attached to keep it from splitting any more than it had. We’ll get it in good condition before we replicate it. The finished replica mold should be very close to what the original wooden mold first looked like. Some flaws of the very old molds are cool and help show their age but as a baker I want to see the images as the first baker that used the mold saw. If not exactly, mighty close to it. 7-8-11 Update: After removing the metal band it was discovered that a few nails were driven into the side to keep it together. In order to to get the crack closed, the nail issue will need to be addressed first. 8-20-11 Update: Jerry has finished with the mold and has sent it back to me for replication. Jerry was not able to completely close the crack due to the nails that were originally driven into the sides of the board. He felt that trying to pull them out might do more harm than good. Fortunately he was able to close the gap enough to make it just a hairline crack. Today Alice will be preparing the board for replication. Copies are expected to be made available by the end of August. Copies are available now. 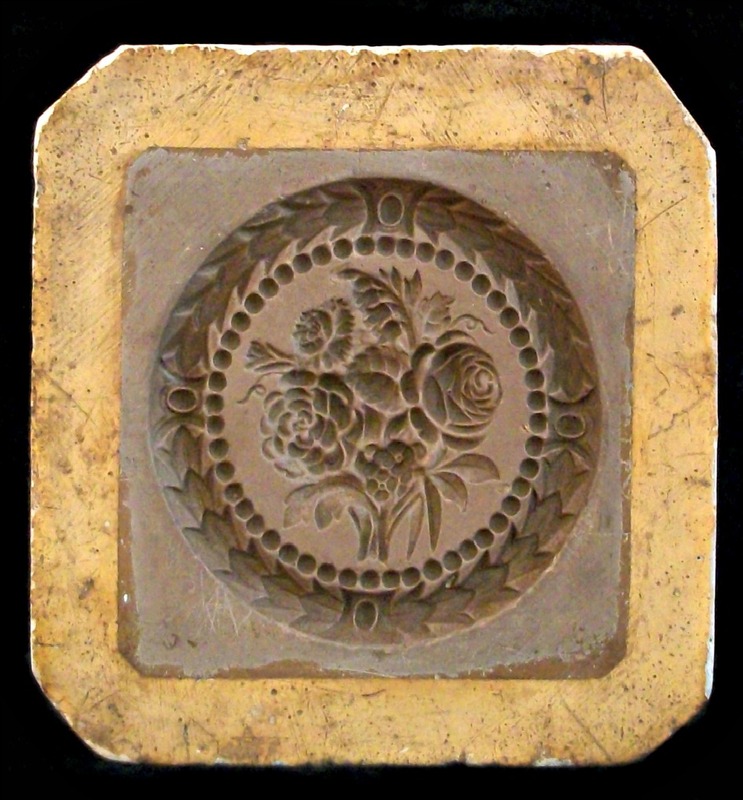 This double sided mold measures about 9 1/4” x 6 7/8” and dates from between about 1780 and 1830. This original mold resides in a private collection here in the USA and we have been given permission to replicate it. 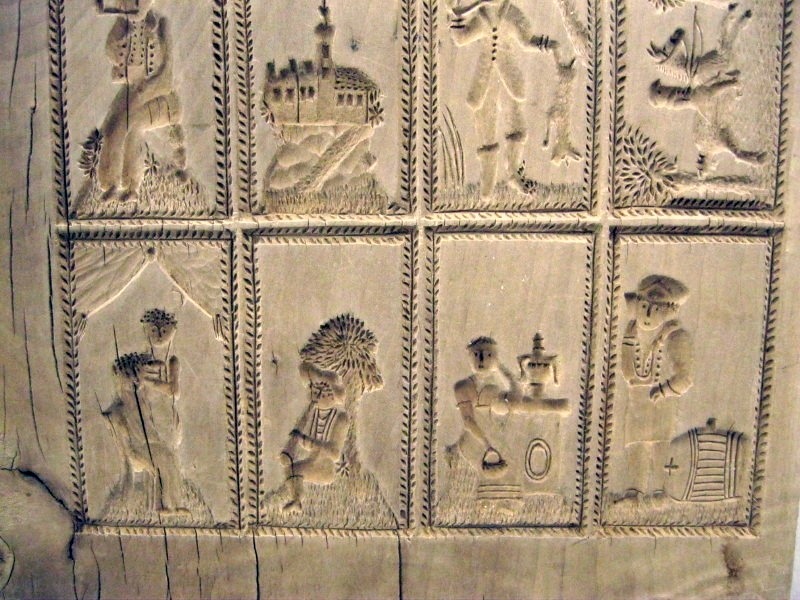 Above: Notice the image in the upper left corner. It appears to be a Wolfman eating an apple under a apple tree?? The images on the front of the mold are very nice but a few on the bottom seem to be “flat”. 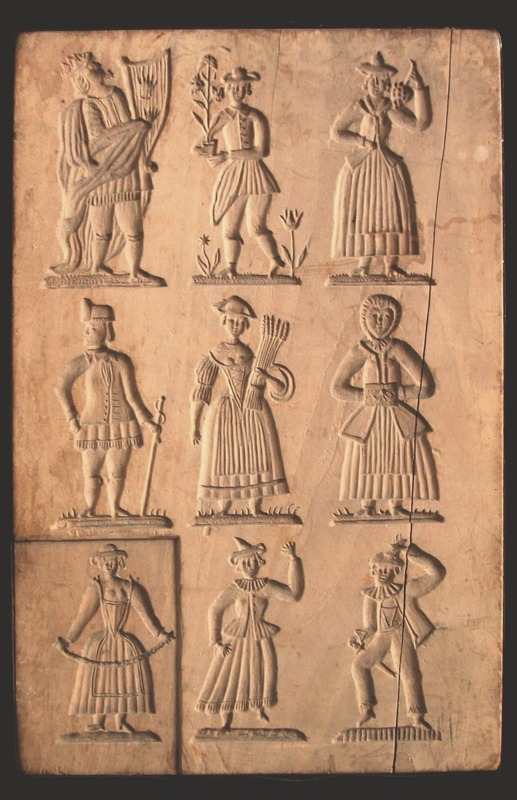 They look to me to not be as nicely carved as the images on the top row. 7-8-11 Update: After inspecting this mold closely it was discovered that there are many small fine splits and cracks in the borders around the images. This will require delicate work and patience to correct them in preparation for replication. The images here on the back are GREAT and have very good depth. No disappointment here at all. I expect to be able to offer copies from this mold by mid August. Weinbacher Spinner Mold. The replica for this mold will be #1612. 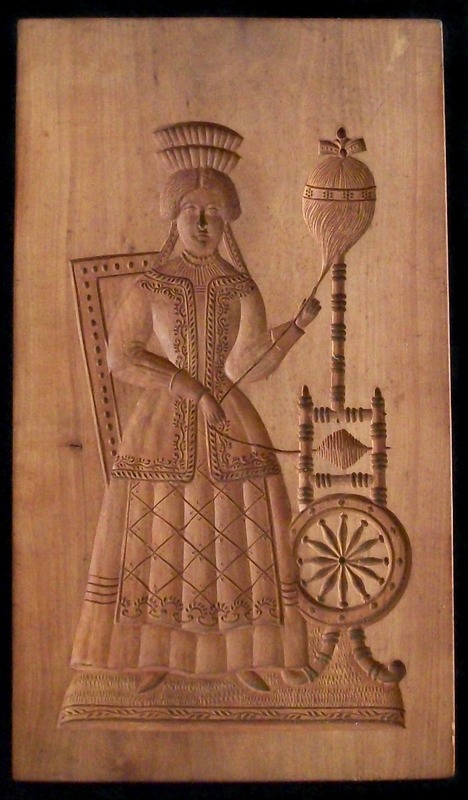 This mold measures about 12 7/16” x 7” and depicts a spinner. This mold has great depth, dimension and details and will produce a very beautiful image. 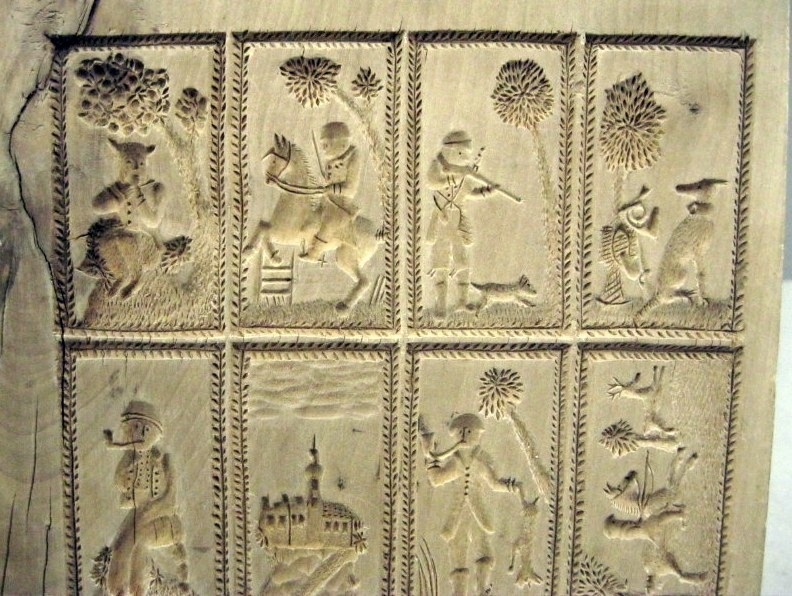 Carved around the mid 1800’s, the original wooden mold comes from Nürnberg Germany where it had been in use in a bakery there. This original mold now resides in a small private collection here in the USA. I expect to be able to offer copies of this mold by late August. 7-21-11 Update: BEAUTIFUL, CRISP and nicely detailed is what I can say about this mold after I have completed a “Mother” mold for it. Today I pour the first ever replica of this mold. I’m looking to produce a cookie from it by this Sunday. This mold will produce lovely paper casting for framing. Omnibus Mold. The replica mold for this mold will be #1613. This mold measures about 10 1/2” x 4 1/2” and depicts a Horse-drawn omnibus. This mold has great depth, dimension and details and will produce a very beautiful image. 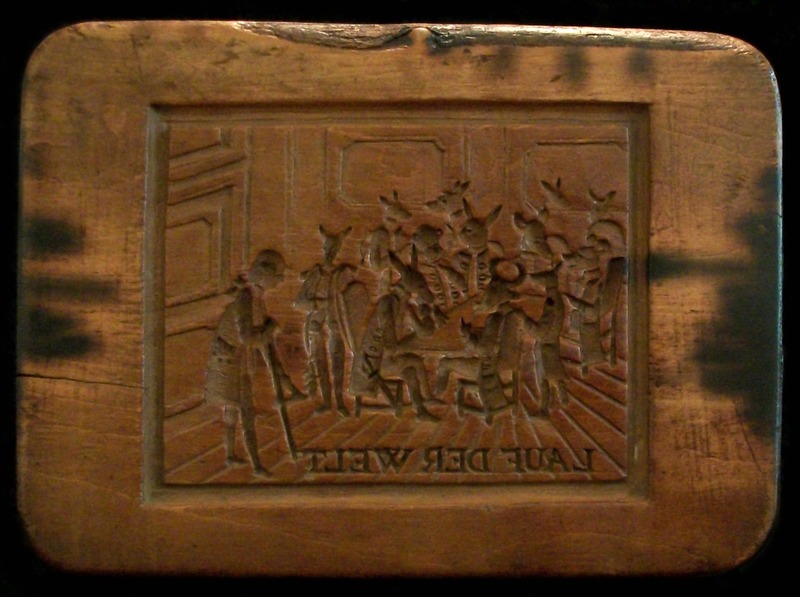 Carved around the mid to late 1800’s, this original mold now resides in a small private collection here in the USA. I expect to be able to offer copies of this mold by late September. I have pressed some of the images and they come out Great. This will make an excellent addition to your Gingerbread displays. 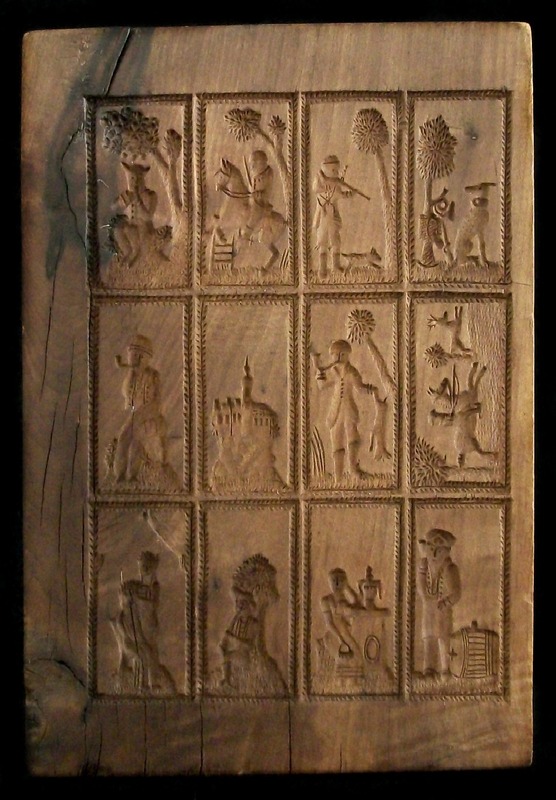 BirdSong Spekulatius Board : This mold measures about 27” x 5” and contains 12 images. It is as you can see, in a rough condition. Most likely we will only be able to use 10 of the 12 images. Metal strips were screwed into the sides to help keep it together and 2 wooden blocks were screwed in the ends on the backside for strength and support. 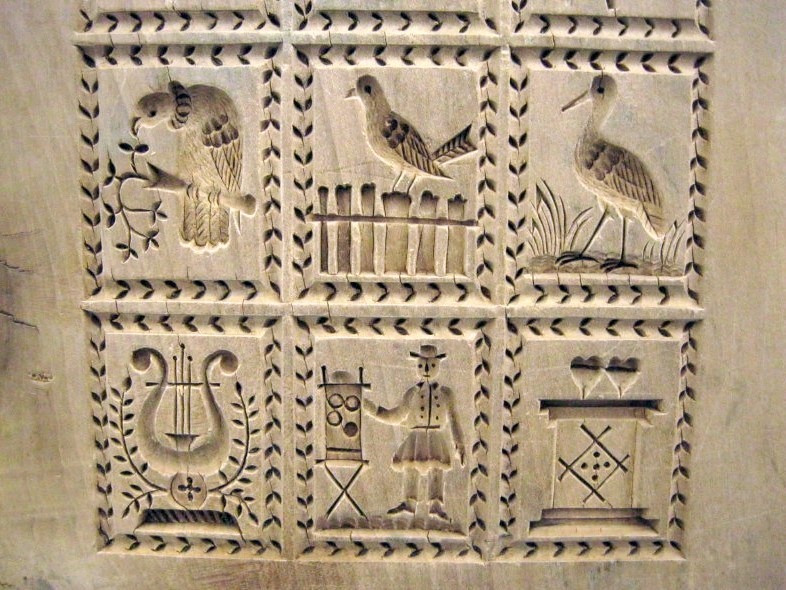 This original mold was carved somewhere around 1800 – 1840 and had been in use in a bakery in the town of Freiburg im Breisgau. Freiburg im Breisgau is a city in Baden-Württemberg, Germany. This board will take a while to get in shape.